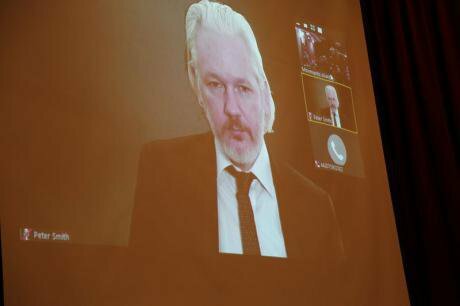 Videoconference of Assange at the Latin American Progressive Encouter, Quito, Ecuador, September 2015. Demotix/Oscar Garrido Ruiz. Some rights reserved. As Ecuadorian President Lenin Moreno visited the United Kingdom this week, there was much speculation as to whether Ecuador would continue to protect Julian Assange. Speaking at a press conference today, as his European tour draws to an end, Moreno appeared to confirm that he is paving the way towards an end to Assange’s asylum. He implied, for the first time, that extradition to the United States would be an acceptable outcome and that his only red line is the death penalty. This fundamentally contradicts the position Ecuador has maintained until now of refusing any possibility of extradition to the United States. Could Moreno’s pandering to the Anglo-American alliance undermine Ecuador’s adherence to international law and hurt its hard-earned international standing? Moreno has long been hostile to Assange’s asylum. Less than a week into his presidency, Moreno referred to Assange as a “hacker”, a depiction which contradicts Ecuador’s legal case which has rested on its protection of Assange for his journalistic activities. Then in January, Moreno claimed the asylum was an “inherited problem” and a “nuisance”, and publicly scolded his now former Foreign Minister for giving Assange the Ecuadorian nationality. In March, Moreno reacted to Assange’s tweets about Catalan independence by cutting off his internet, barring visits and imposing an open-ended regime of virtual isolation. In March, Moreno reacted to Assange’s tweets about Catalan independence by cutting off his internet and, more cruelly, by barring visits and imposing an open-ended regime of virtual isolation. A few days before the presidential visit to the United Kingdom, Moreno’s newly appointed Foreign Minister announced the Ecuadorian government was “reviewing” Assange’s “situation” and that an asylum could not last forever. Assange sought asylum in the Ecuadorian Embassy on 19 June 2012. After two months of heated debate inside President Rafael Correa’s government, Ecuador granted asylum to Assange on 16 August 2012. Ecuador did this on the basis that there were reasonable grounds for fearing Assange was the victim of a political persecution that could jeopardise his safety, integrity and human rights. The context of aggressive rhetoric against Assange in the United States played an important role in forging Ecuador’s decision. The release of the Collateral Murder video in Iraq, the Afghanistan and Iraq War Logs and the vast trove of leaked diplomatic cables had triggered an angry, jingoist reaction in some of Washington’s political circles. The Democrat and former US official-turned pundit Bob Beckel called for Assange’s assassination: “illegally shoot the SOB” were his exact words. Even the mainstream Vice-president Joe Biden referred to Assange as a “hi-tech terrorist”. Documents emerged suggesting that Assange was being investigated by a federal grand jury in Virginia and that there was a sealed indictment against him. Meanwhile, Chelsea Manning had been arrested and court-martialled. She would subsequently be sentenced to 35 years imprisonment. President Obama commuted her sentence before leaving office. Ecuador’s decision to grant asylum to Assange was founded upon Ecuador’s adherence to the 1954 American Convention on Diplomatic and Territorial Asylum. The commitment to granting asylum was a serious undertaking. The laws on asylum include the sacrosanct obligation to non-refoulement, a principle designed to prevent states from terminating asylum and avoid the subsequent extraditions of political asylees that regime change so often entail. Non-refoulement is also a principle that is enshrined in article 41 of the Ecuadorian Constitution. Ecuador proposed that Assange go to Sweden to face questioning provided there was a commitment that he would not be extradited to the United States. Assange, however, was wanted for questioning in Sweden on allegations of sexual assault. It was therefore paramount for Ecuador to actively explore solutions for that judicial process to advance. Ecuador proposed that Assange go to Sweden to face questioning provided there was a commitment that he would not be extradited to the United States. The Swedish authorities refused to offer such guarantees. Then, on 25 July 2012, almost a month before the asylum was granted, Ecuador proposed that the Swedish Prosecution question Assange inside the Ecuadorian Embassy. This would allow the Swedish Prosecutor to decide whether there were grounds on which to charge Assange formally. For almost three years, the Swedish Prosecution refused, until in March 2015, it accepted. Another year elapsed for the agreement to be signed by the Prosecution Authorities of both countries. Assange was questioned on 14 November 2016 and it took the Swedish Prosecution another six months and five days before it finally announced it would not be pressing charges. The European Arrest Warrant rescinded, and it seemed to be a matter of days before Assange could walk free. Donald Trump, when asked about the intention of the Department of Justice to arrest Assange, said he was "ok with it". Meanwhile, however, the Trump administration had stepped up its anti-Assange rhetoric. The new occupiers of the White House were characteristically lambasting in their approach. In April 2017, the US Attorney General Jeff Sessions spoke of the possibility of filing criminal charges against WikiLeaks' associates for the 2010 leak of US diplomatic cables and military files, adding that he would also be willing to investigate whether WikiLeaks bore criminal responsibility for the more recent revelations about sensitive CIA information. The same month, the then CIA Director – now Secretary of State – Mike Pompeo, labelled WikiLeaks a "hostile intelligence service". And Donald Trump, when asked about the intention of the Department of Justice to arrest Assange, said he was "ok with it". In the last few months, as a result of Wikileaks releasing a plethora of classified CIA documents in 2017, a fierce campaign to link Assange to Russia – a powerful narrative in the context of the West’s renewed fixation with the Russian menace – has been unleashed. Recent Congressional hearings and statements made by Republicans and Democrats alike are full of language suggesting that Wikileaks is a belligerent intelligence organisation. The idea is to gradually sow the seed that the Assange case has nothing to do with the issue of freedom of expression and the protection that journalists and whistle-blowers enjoy in the First Amendment of the US Constitution and the 1989 Whistle-blower Act. Rather, what we are dealing with is a matter that falls under the 1917 Espionage Act, approved by Congress during the First World War in order to stop state secrets from being handed over to foreign governments: a piece of antiquated legislation that does not apply to the publishing of leaked documents in the media. The closure of the case in Sweden in May 2017 should have put an end to the Embassy standoff and enabled Assange to travel to Ecuador for his protection. If anything, events over the last year have demonstrated that the argument that Assange was “holed up” in the Embassy so as to avoid facing sexual assault allegations in Sweden is wrong. He remains in Ecuador’s diplomatic mission despite the case being long since closed. With the case dropped in Sweden, the affair has gone a full circle and the key issue is Washington’s wrath with Wikileaks. Currently, the only remaining legal difficulty is Assange’s 2012 violation of bail upon leaving British jurisdiction and entering the Ecuadorian Embassy. The Police could of course arrest Assange for his breach of bail. A prison sentence would be completely disproportionate, given the long confinement Assange has endured, but if this is what it takes to guarantee Assange’s freedom, so be it. Ecuador, however, would have to ensure that any potential imprisonment over the issue of bail does not become a trampoline for extradition to the United States. Thus, we are back to Ecuador’s requirement of guarantees of non-extradition, this time from the United Kingdom. This holds true as long as Ecuador remains committed to the principles of non-extradition for journalistic activities. Moreno’s latest declaration, however, suggests otherwise. Ecuador is in a strong position. Six years after Assange walked into its embassy, Ecuador’s initial fears of political persecution, far from being ill-founded paranoia, have been proven right. With the case dropped in Sweden, the affair has gone a full circle and the key issue is Washington’s wrath with Wikileaks. In December 2015, the UN Working Group on Arbitrary Detention adopted its Opinion 54 which found that “the various forms of deprivation of liberty to which Julian Assange has been subjected constitute a form of arbitrary detention” which “should be brought to an end”. This provided a robust legal backing to Ecuador’s position. On 13 July, Ecuador was given renewed international legal endorsement by the Inter American Court of Human Rights when on 13 July it released its long-awaited ruling on the issue of asylum. The Court’s findings include its recognition of the right to asylum in embassies, states’ obligation to give safe passage to embassy asylees, and the duty of states that have granted asylum to respect the principle of non-refoulement. The Court’s seminal decision essentially argues that the United Kingdom has a legal obligation to grant Assange free passage to Ecuador. As for Moreno, caving in now would entrench his legacy as yet another puppet in Latin America’s long history of yielding to bullies. Ecuador has a choice. It can take advantage of this new victory, demonstrate its respect for the internationally recognised principle of non-refoulement and uphold the asylum as long as its causes persist. Or it can hand Assange over to the British authorities making future extradition to the United States likely. If Ecuador chooses this path, it will lose the diplomatic standing it has earned for having upheld, despite tremendous pressure, its commitment to the laws of asylum. As for Moreno, caving in now would entrench his legacy as yet another puppet in Latin America’s long history of yielding to bullies.